A small PHP function which can be quite useful, especially when doing the URL rewriting. This function transforms any accented characters of any string , removing special characters and replacing empty spaces by dashes. Published by jak58. Latest update on January 3, 2013 at 05:51 AM by jak58. 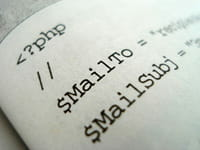 This document, titled "PHP - Clean up a string," is available under the Creative Commons license. Any copy, reuse, or modification of the content should be sufficiently credited to CCM (https://ccm.net/).